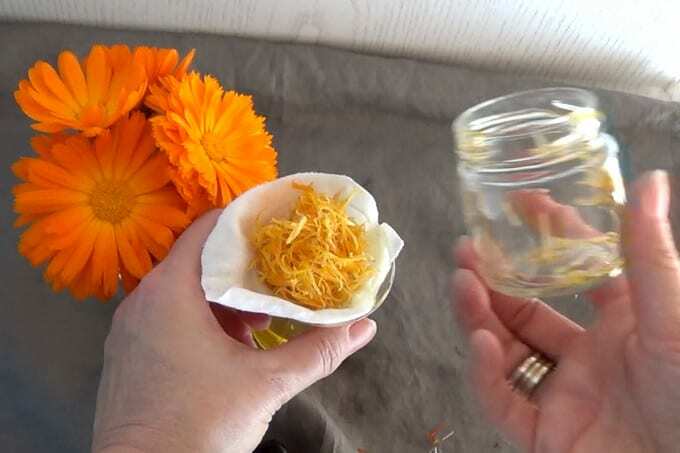 Calendulas are not only a decoration of our gardens where their orange and yellow flowers shine and light up every corner, but they are also an integral part of a medicine cabinet of any herbalist. Easy to grow from seeds, calendulas belong to one of the most popular herbs used internally as well as externally in herbal medicine. 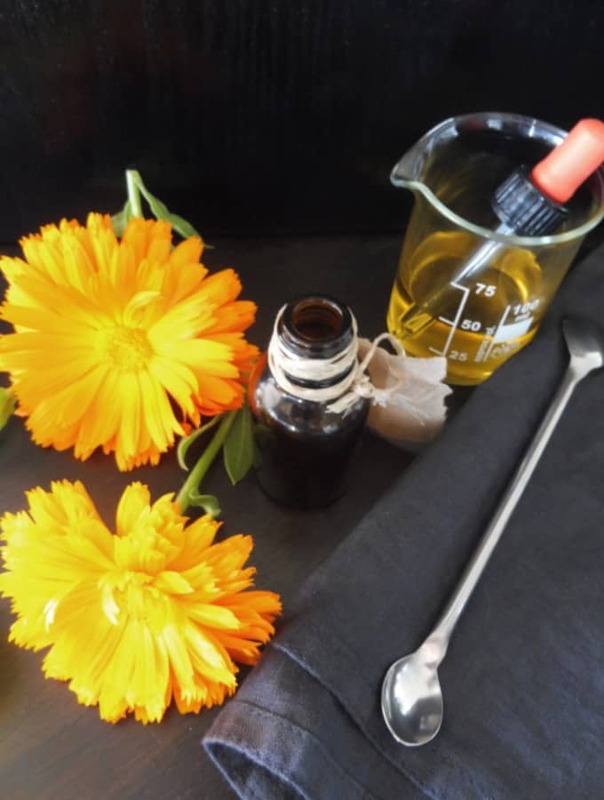 Calendula tincture has a large spectrum of uses from sore throat inflammations to healing open wounds and hemorrhoids. Its spasmolytic effect helps treat abdominal cramps and constipation. Whether you grow your own calendula or you get your desired marigold (calendula) flowers from a shop, what can you do to harness their power? The gentle and versatile way of preparation is a classic herbal tea. 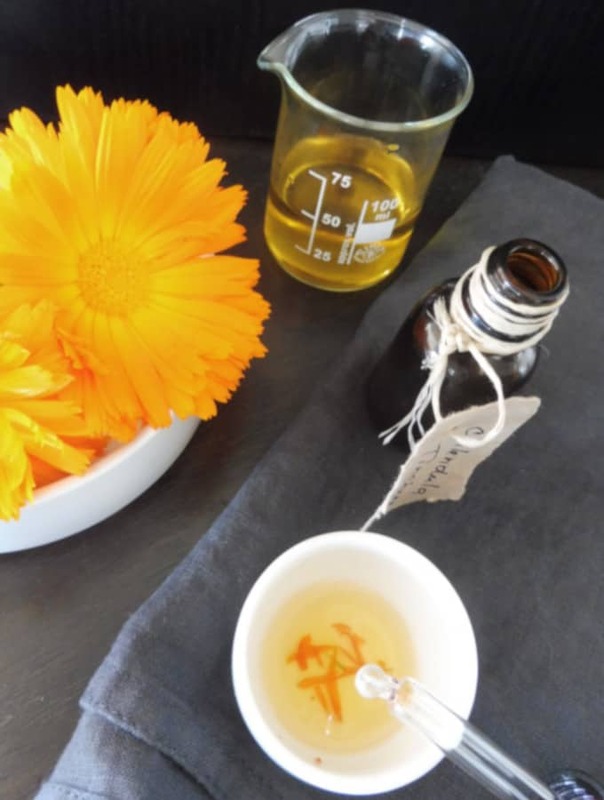 When you feel sad, tired, low in energy or fractured from the troubles that life can bring, a warm cup of calendula tea will revive in you the healing power, energy, and optimism you need in your life. However, where we need to achieve a higher concentration of the active substance and wish to receive a stronger effect on our body, we prefer tincture. We also use it where we know that active substances dissolve better in ethanol than in water. The word “tincture” was originally used in pharmaceuticals and derived from the Latin tingo, tinctus – stained, meant dye or drug. Tinctures are made of single plants or mixed plants. Depending on herb one can use various parts – roots, bark, petals in fresh or dried form. Tinctures are a great option for those who lead a busy lifestyle and don’t have time to prepare herbal teas daily. How to make a tincture? 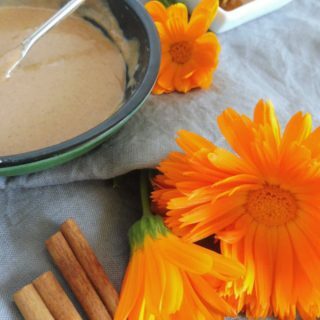 This helped to soothe sore throats and stop infections, laryngitis and tonsillitis, coughs, dryness of the lungs and digestive upsets. 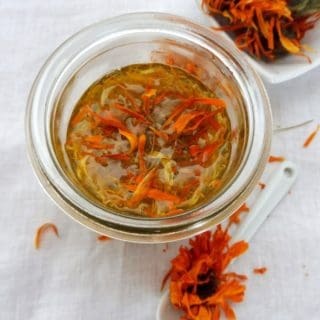 Calendula contains astringents such as tannins that are used topically on the skin for treatment of acne. Calendula tincture reduces inflammation and prevents further spread of the infection over the skin. It also promotes rapid healing of the skin.  . You can apply directly on the skin to treat acne or impetigo-simply add a few drops of the tincture to any kind of neutral skin cream you use every day just before applying to your face, or you can add a few drops of tincture to every application of face wash. Alternatively, make acne mask from calendula tincture, cinnamon and essential oils – the recipe is coming soon. as a mouthwash for infected gums and other mouth problems -. You can dilute a few drops of tincture in a glass of water and use as a mouth rinse or gargle for sore, inflamed throat and gums. 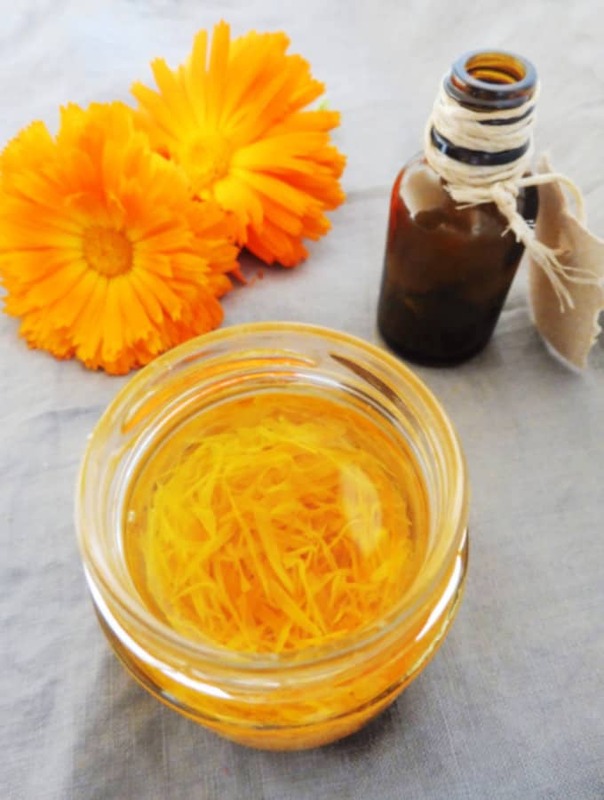 Calendula tincture can be added to bath water or a hair rinse to help itching or irritated scalp and skin conditions. Can you make a non-alcoholic tincture? If you want to create a non-alcoholic tincture, then you can simply replace the alcohol with Apple Cider Vinegar. This vinegar-based tincture will keep for at least 1 year. Why store tincture in dark places? The medicinal compounds in tinctures are both light-sensitive and air-sensitive so they may break down with prolonged light exposure. If kept correctly tincture shelf life is more than 5 years. submerged completely. If needed add additional alcohol. 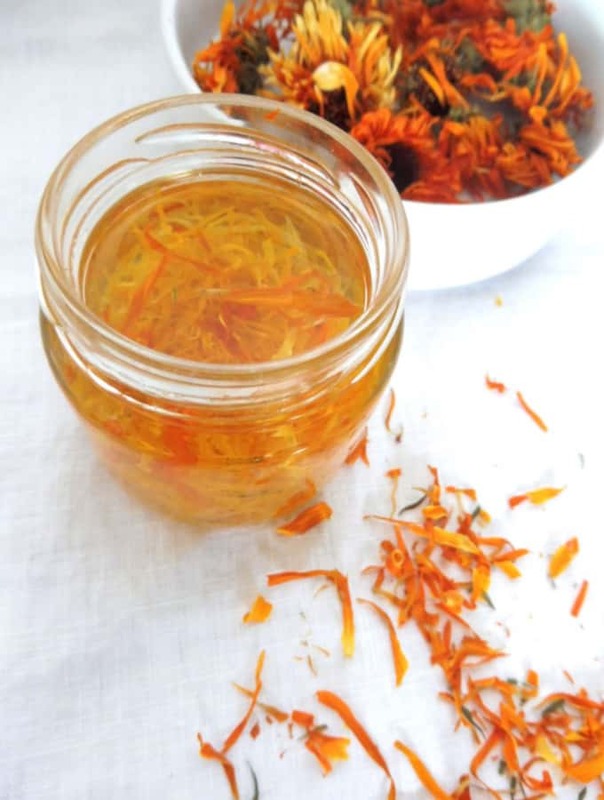 7. strain the calendula petals from the alcohol. Ideally Pour the tincture into a dark bottle with dropper. Oh wow! I could use this for a lot of the reasons you listed. And it’s so simple to make. Thanks for compiling this post! Great ideas. I make this tincture with glycerin and find it is wonderfully good in taste as well as medicinally sound. I grow my own flowers so it is easy to make. Thanks for sharing! 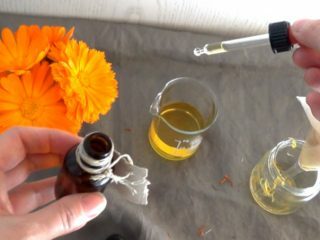 Calendula is one of my favorite flowers/herbs, but I never thought of making a tincture with it. Great information in this post and so many ways to use the tincture! I love using natural remedies and may have to try this one out. 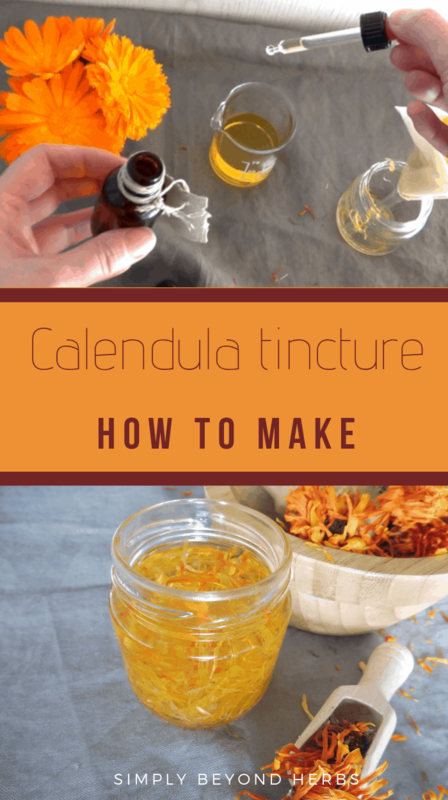 I’ve never thought of ingesting calendula! I always just add it to salves and lip balms. Thanks for this information! Another reason to grow more calendula this year.